Identity/Class: Normal human, trained to the peak of physical and mental perfection. 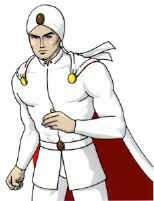 Powers/Abilities: Kalimán is extremely fit, being proficient at all sports and athletic activities. His mind is finely honed, so that he is in effect a living encyclopedia, retaining all knowledge he ever encounters. He is skilled in both the arts and sciences, and is able to use both hypnosis and mimicry. History: Kalimán spent his childhood amongst Tibetan Lamas, where he learned to use his mind to its greatest potential. He also trained his body as he grew so that by the time he was an adult he was as physically fit as a normal human can be. With a strong sense of justice, he then set out into the world to right wrongs, having a series of fantastic adventures along the way. Kalimán has a strong moral code: he never kills a human or an animal; never uses any kind of weapons, except, in extreme cases, a blow-gun which fires small inducing-sleep darts, paralyzing his adversaries for several hours. His constant companion is an Egyptian boy called Solin, whom he rescued during his first adventure. His escapades take him around the world, from India to Tibet, from African jungles to Mayan ruins. Kalimán originated in the Mexican radio broadcasting industry. His comic books have been published weekly for the last thirty years in the Latin American, Spanish speaking market. Louis-Gabriel e-mailed me to say "In Colombia around the mid 80s there was a small popularity boom of Kalimán. He began to take on a wider range of villains. From smugglers and criminals, he also took on villains of a 007 scope. Criminal organizations, assassins and spies. In addition he faced supernatural foes." Thanks for this extra info! There is an in-depth website devoted to him (in Spanish) at www.kaliman.net. 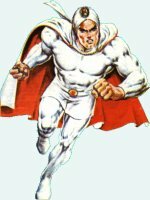 There is another, maintained by Javier Delgado, at www.kaliman.com.mx (also in Spanish) with a short English introduction to the character, and a gallery of images. Javier also mentioned that "Kaliman born as a radio play in Mexico, but it was also produced in Columbia", and notes a site where you can find some chapters of the Columbian version of the plays. He also told me of yet another site which covers this popular character. There is even a forum to discuss this character. Thanks Javier.